You will notice this last paragraph especially- it was written back when freedom of thought was still allowed within the pages of the Watchtower. What a balanced way to put it, despite the old-fashioned wording. Could you share this article with your mate? 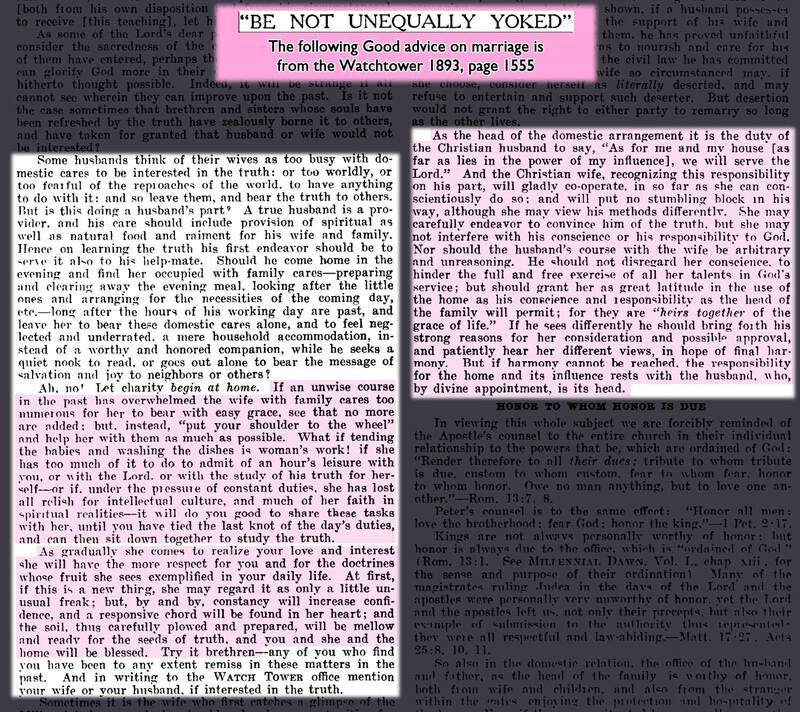 You are only quoting from the Watchtower and nothing else. Try it if you can, and hopefully it will help. NOTE: Click here for graphic of the original article. Good job JJ! Your web site is always very informative and helpful. I am sure these articles will help people for years to come. Thanks for stressing patience JJ. Some have tried to forcefully to confront their marriage mates with what they have found and only weakened considerably their marriage. Its strange that sometimes the friends even consider old Watchtower literature as semi-apostate. I remember when a few Witnesses began reading some old books and Watchtowers at the KH library, a special pioneer said “I don’t think we should be doing this, it could be dangerous.” As if she were afraid of finding out something. A big thanks for your continued efforts in sharing your Christian journey. A well thought out article. Thank you. Hello to all. I have recently been told about this site. It is wonderful, and thank you. I have, over the last couple of days, read every post since early February. There is a lot of great information. I am an active witness starting to attempt the process of fading. My biggest holdup is my wife. I am trying desperately to show here the truths that I have seen. I want to thank all of you for the informative material in these blogs. JJ, this post really helps me to be patient in trying to show my wife what I have seen. Sometimes I feel like I am making great progress and other times it feels like I have gotten nowhere. I know this will be the case, perhaps for a long time to come. But I will push on. I can’t wait to discuss more in the future with all of you. I’m in the same boat with my wife as you are, nice to have you around. Welcome Papabear. Glad to have you here! Looking forward to fellowshipping with you. You are very welcome here brother- I look forward to hearing more of your thoughts and background as time goes on. I feel it is critical that we stick together, as we are a minority in a minority, sometimes with our backs to the wall. If you can, please IM me through the site or email me at jwstruggle(àt)gmail(dot)com. You are in my prayers- as soon as I finish this comment I will say one. I WAS THE ONE AT FIRST WHO STARTED TO TELL MY HUSBAND THINGS AND I STARTED TO SWAY HIM BUT THEN WHEN I DID FOR SOME REASON I STARTED TO REGRET IT THINKING ID DONE SUMAT REAL BAD AND ID TURNED HIM AGAINST THE TRUTH IT HAS BEEN A VERY UP AND DOWN EXPERIENCE FOR ME OVER THESE LAST FEW YEARS,BUT IV FINALY COME TO TERMS WITH LEAVEING EVEN THOE I NEW THEY WERE WRONG I STILL HAD THE DEEP DEEP DREAD I WAS BEING MISSLED AND WAS VERY VERY WRONG.NOW MY HUSBAD IS THE ONE WHOS ALWAYS TELLING ME AND HELPING ME WHEN I START TO WORRY. Hi, jw struggles, i came across this website yesterday and i love what is being presented here. I am a closet apostate lol! Find out the thruth was not true a year ago. But have stayed because of my love ones( a lovely girl) though am the only witness in my family. I still find it difficult to leave.but am resolved to hold the bull by the horn come what may!- diassociating myself from the org. Please remember me in your prayers. Greetings from Ghana, west Africa. You will find spiritual refreshment here. May Jehovah bind up your wounds, and heal your heart and show you the real truth. He did for me! Your sister in the truth, Freethinkerinjah . Hullo Richard from Ghana west Africa! Welcome to my part of the world Australia. When you dissasociate your self from the tower, what will you do for spiritual refreshment? Dont leave your heavenly Father what ever you do. He is not in religion, he lives in the hearts of his true followers. 1 John 4:4 Keep reading and praying for Gods direction and help always relying on him. Rely not on anyman. l can understand how hard it really is for ones who have made a choice to serve the living and true God but because of Religion, have had to give up on there relationships with the ones they love. Think perhaps there may be a few like that around. Mormans, exclusive bretheran, Jehovah witnessess. They all rip families apart if people find they are fraudulant. But of cause each grow at different rates and step by step the true sheep are put back into Christs loving arms.